As I mentioned in my last post, my #oneword for 2016 is "Reflect." Here is the first of a series of blog posts I am composing as I reflect upon my 16 years in education. I realized it during the 2001-2002 school year. The day is burned into my memory. It was my Freshmen World History class, 6th period to be exact. We were right in the middle of our unit on the Renaissance. I had a Powerpoint projected onto the screen in my dimly lit room and my students were taking turns reading out of the book as I walked around the room making sure students were on task. Some days we would read out of the textbook, other days I would make my students take the notes that I was writing on the overhead. Yes, that type of overhead. I eventually upgraded to Powerpoint and had my students take notes from the bulleted slides that I had created. Towards the end of each class, I'd give my students some kind of worksheet or crossword puzzle to reinforce what they had learned. At the conclusion of the unit, students would take a 35-50 question test that consisted of several multiple choice questions (it was easy for me to grade), matching questions and one essay. I was in my third year of teaching and I was teaching each class, World History and Nebraska History, the exact same way I had since I began teaching in 1999. 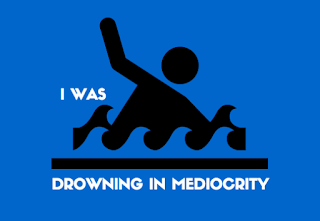 I was drowning in mediocrity. Looking back now, I realize that I didn't know any better. Sure my Principal had issued a challenge to me after my first year of teaching, but I was teaching Social Studies the way it had been taught to me. It was comfortable. It was easy. My teaching had become routine. The filing cabinet in the corner was my best friend. All of my units were pre-packaged and ready to go each year. My Powerpoints were saved on the local server, easy to pull up for presenting. A quick trip to the copy machine at the start of each unit to print my worksheets, quizzes and tests and I was good to go for a couple of weeks. Repeat each year with minimal changes or reflection and another year was in the books. Easy peasy. I didn't like how I felt after teaching the lesson that I mentioned above. I didn't feel like I was making a difference. I was just another class on my students' schedules. I was bound and determined to do something about it. I remembered my social studies classes in high school and college. I didn't enjoy them. Actually, I hated them. Yet here I was teaching a subject that I loved. I thought to myself, "You can't say that you hated social studies classes....you just hated how the information was taught to you." I came up with a new motto for the 2002-2003 school year. I printed my new motto and placed it on the wall so I could be reminded of it daily. I talked to my students about what those three words meant to me as a teacher. Fast forward 6 years. Take a look at the images below. It's my classroom after "the change." It took time and effort, and most importantly, the willingness to change. I tried to create a learning environment that I would have wanted to be in if I was a student. What happened during the change? I started utilizing the technology in my classroom to have students create. I got rid of all of my desks and replaced them with tables. I placed two couches in my room that students could sit in whenever they wanted. I had tubs of markers, colored pencils, scissors, paper clips, glue sticks and scratch paper. I started playing music a lot, not just as students entered the room. My classroom became a noisy environment (sorry, Mrs. Coover), but the students loved it. And I loved teaching. I looked forward to coming up with different, creative ways to teach. Yes, it took some time out of school to do some extra planning, but it was well worth it. I loved my new classroom. I was no longer drowning, I was now doing the breaststroke! Reflecting on this moment in my teaching career makes me proud that I made this decision.